Vacation cottage at the edge of sea in Ocean Point area of East Boothbay. As the name implies this three bedroom cottage sits at the edge of the sea and provides spectacular views of the Atlantic Ocean, Ram Island Lighthouse, and islands. Enjoy swimming at Grimes Cove Beach, just a brief walk around the corner. This cottage is located at the desirable Ocean Point area of East Boothbay. The Ocean Point Colony Trust maintains a clubhouse and tennis courts (for a fee) where many enjoyable activities take place during the summer that you and your family could sign up for at the Casino during the time of your stay. It is also within walking distance to the Wilson Chapel, very popular for weddings, and the rocky shoreline that abuts Shore Hill Road, a favorite to all such as Plein air artists, photographers, locals grabbing a quick lunch or visitors enjoying a picnic. Enjoyed by couples, families, definitely a very popular location for all and where the land meets the sea. 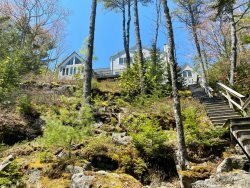 Enter the cottage into a small hallway leading to the cottage kitchen on your right, the first-floor bedroom with a double bed and shower bathroom on the left or straight ahead into the expansive living/dining room with its wall of windows to the ocean. Lots of seating for dining, relaxing, or visiting. Enjoy a fire in the wonderful classic Maine Stone Fireplace, or toast some marshmallows for S'More's as an after dinner treat! If watching the wonders of the ocean is not what you want to do, there are many additional options! Take a walk over to Grime’s Cove and swim out to the swim float. Explore the craggy shoreline and the multitude of tide pools on your way there and back. Take in the local and varied architecture that exists in this quaint and beautiful sea-side summer community. Walk over to Ocean Point Inn for locally inspired cuisine. Take a guided kayak tour and explore the rugged coastline from the water! The Boothbay Region Land Trust has miles and miles of pet- friendly trails, several in East Boothbay, which offer an enticing way to see more of this beautiful peninsula. Grab a breakfast pizza from East Boothbay General Store or mosey over to Lobsterman’s Wharf for some exquisite food in a wonderfully laid-back ambiance! Head to Boothbay Harbor for even more options like shopping, antique hunting, and some great galleries! Fishing trips, sightseeing excursions for whales and puffins, lobster bakes, music and sunset cruises and of course, lots more options for stellar food and live entertainment throughout the summer! Peruse our website for local vendors, eateries, and activities. Replete with all things vacation; if you can think of it, our site most likely covers it! Be sure to reach out to us if you need any help creating the perfect vacation! Linens are NOT provided for your stay - arrange to rent them from our linen service or bring them from home. Don't forget the beach towels for your stay. From the stone staircase of the Janet M. Wilson Memorial Chapel you can look out to the Atlantic and see Fisherman’s Island, Ram Island, and the Hypocrites in the distance. “It’s steps away from the water on Ocean Point,” says Reverend Connie Mills, “and the stonework and stained glass inside are gorgeous.” The chapel was built in 1917 and named after the wife of Lewis Wilson, the original builder."